After telling her loved ones, “I’ve seen Jesus and He is beautiful. I’m ready.” Glenna Eileen (Miller) Jarvis, 84, of McArthur, moved on up to Gloryland on October 11, 2018 peacefully in her apartment at “The Maples.” Born August 5, 1934 in Eldorado, Ohio to the late Kenneth H. and Mable L. (Siler) Miller, Glenna was a 1952 graduate of Eaton High School. 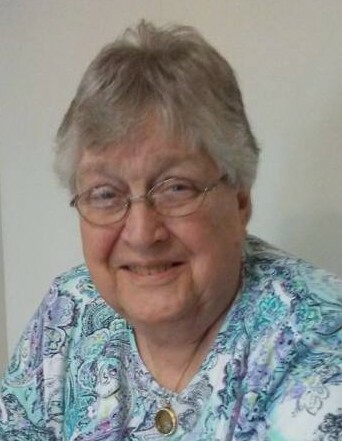 She moved to Vinton County in 1956 when she married the father of her children, John, with whom she co-owned and operated Vega Jersey Dairy Farm for many years. She was blessed with and is survived by five beautiful children Donna Lynn Jarvis (Chris) Miller of Alexandria, VA., Earl Thomas (Pam) Jarvis of Ray, Janell Lucille (Dan) Thompson of McArthur, Kenneth Alfred (Linda) Jarvis of Jackson, and Ruth Laureen Jarvis of McArthur. She is survived by six grandchildren: Ross (Debbie) Miller, Adam (Scarlet) Jarvis, Danielle (Tom) Ramage, Hannah Thompson, Chad (Lauren) Cordial and Rachael (Josh) Brewer and 11 great-grandchildren: Katie, Ryan and Julie Miller, Ella, Sadie and Meredith Jarvis; Isaac, Clara Eileen and Lucas Ramage; Skylar and Chase Cordial. Additionally, she is survived by her brother, Douglas (Arlene) Miller; sister, Sylvia (Gene) Hack; sister-in-law, Linda Miller; father of her beloved children, John (Rosalie) Jarvis; as well as many nieces, nephews and “adopted” children who considered her mom or grandma, all of whom she held dear to her heart. In addition to her parents, Glenna was preceded in death by two grandchildren, born into Heaven; brothers, Leonard Paul and Raymond Allen and sisters, Ruth Anna Guckian and Kay Veldine Miller. A celebration of Glenna’s life will be held on Wednesday, October 17, 2018, at 1:00 p.m. at Grace Baptist Fellowship, 240 S. New York Avenue, Wellston, with Pastor Timothy O. Jones officiating. Graveside services will be held at the convenience of the family. The family will receive friends at the church on Tuesday, October 16, 2018, from 4:00 to 8:00 p.m., where an open Eastern Star service will commence at 8:00 p.m.; and on Wednesday, prior to the service, from 11:00 a.m. to 1:00 p.m. In lieu of flowers, the family requests that donations be made to the Vinton County 4-H Program Food Booth (designate “4-H Food Booth” at time of donation; donations may be done online or mailed to P.O. Box 473, McArthur, OH 45651) or the Vinton County Senior Citizens (mail donations to PO Box 481, McArthur, OH 45651) in Glenna’s memory to honor her love of community and baking. Please visit www.rmwilliamsfuneralservice.com to leave a message of comfort, encouragement, or condolence to the family or to view Glenna’s online video tribute. R.M. Williams Funeral Service, Wellston, is honored to care for the Jarvis Family.